Curious that there might be a correlation between late voting and late counting, I asked the Boulder County Clerk’s office if they had any information about which votes were counted when. 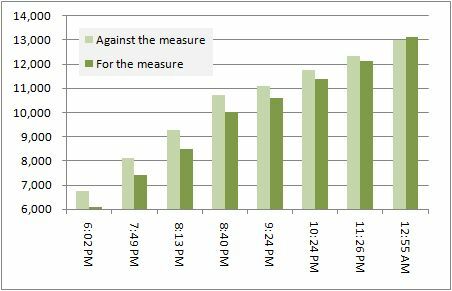 According to them, the early returns (7:00 p.m.) were primarily pre-Election Day votes, but not entirely. 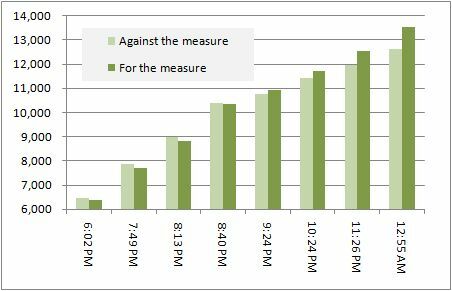 Between 7:00 and 10:00 p.m. the returns were a mix of pre-Election Day and Election Day votes. From 10:00 p.m. on, all of the new returns reported were votes cast on Election Day. “It really was a great ‘community coming together’ moment yesterday,” said Fenberg. In Chicago at least, it is common courtesy for the deceased, to not start counting their votes until after midnight.